Hunter Andrew Pence (born April 13, 1983) is an American professional baseball right fielder for the Texas Rangers of Major League Baseball (MLB). He previously played for the Houston Astros, Philadelphia Phillies and San Francisco Giants. Pence stands 6 feet 4 inches (193 cm) tall and weighs 230 pounds (100 kg). He bats and throws right-handed. He was a member of the 2012 World Series and 2014 World Series championship teams with the San Francisco Giants. Pence attended Arlington High School in Arlington, Texas. After playing outfield his first three years, he moved to shortstop his senior year. He attended Texarkana College for a year and was a designated hitter on the baseball team. He transferred to the University of Texas at Arlington (UTA) where he returned to the outfield. He hit .347 as a sophomore in 2003 and was named a first-team all-conference outfielder. Despite missing 15 of UTA's 30 Southland Conference games the following year due to an injury at mid-season, he was still named the 2004 Southland Conference player of the year, leading the league with a .395 batting average. Pence still holds the conference record for doubles in a single series, with 5. Pence was drafted by the Milwaukee Brewers in the 40th round of the 2002 Major League Baseball Draft, but did not sign. In the 2004 Major League Baseball Draft he was drafted in the second round (64th pick overall) by the Houston Astros out of the University of Texas at Arlington. He played the 2004 season with the single A Tri-City ValleyCats in Troy, New York. During that year, Pence, along with current major leaguer Ben Zobrist helped lead the 'Cats to a 50 win season in the New York–Penn League, the second-most in ValleyCats history. That year, the 'Cats defeated the Brooklyn Cyclones in the first round, but lost to the Mahoning Valley Scrappers in the league championship. In 2006 with the AA Corpus Christi Hooks, Pence batted .283 and hit 28 home runs, with 95 RBIs. He had 17 stolen bases, while being caught stealing only 4 times. In 2006, he was one of three outfielders named to the Baseball America Minor League All-Star Team. Pence began the 2007 season as the AAA Round Rock Express' center fielder, though he made a serious run to make the big league club out of spring training. Pence made his major league debut as the Houston Astros center fielder on April 28, 2007, versus the Milwaukee Brewers and got his first major league hit and scored his first run. Pence's first home run in the majors was a grand slam, against the St. Louis Cardinals on May 5. Pence hit a dramatic walk-off home run against José Mesa of the Philadelphia Phillies in the bottom of the 13th inning at Minute Maid Park on July 3 in a 5–4 win. It was Mesa's only pitch of the game. Pence was named National League co-Player of the Week for May 14–20, after recording a 1.091 slugging percentage and .625 on-base percentage with 2 home runs and 5 RBIs. Pence was a unanimous selection to the 2007 Topps Major League Rookie All-Star Team. The selection was the result of the 49th annual Topps balloting of Major League managers. Pence (15 points) came in third, and lost out to Braun (128 points) in the vote for the 2007 NL Sporting News Rookie of the Year Award by 488 major league players and 30 managers. He also lost out to Braun in the competition for the 2007 Baseball America Rookie of the Year Award, in the vote for the 2007 Players Choice NL Most Outstanding Rookie by their fellow major league players, and in the Baseball Prospectus 2007 Internet Baseball NL Rookie of the Year Award, with 16 first place votes, versus 666 for Braun. After Michael Bourn was traded from the Philadelphia Phillies to the Astros before the 2008 season, Pence moved to right field while Bourn took over in center. In his sophomore season, Pence set new personal single-season records in home runs (25), runs batted in (83), doubles (25), hits (160), and at bats (595). However, his batting average dipped to .269, his on-base percentage fell to .318, and his slugging percentage also fell to .466. Pence led the league in outfield assists with 16, committed 1 error, and had a fielding percentage of .997. In his third season (2009), Pence was named an All-Star for the first time. In his fourth season (2010), Pence batted .282 with 25 home runs, drove in 91 RBIS and played 156 games. For the week of August 30 – September 5, 2010, Pence was named National League Player of the Week for the second time in his career after batting .500 (11-for-22) and slugging .909 with two home runs. Pence was named a 2011 All-Star as a reserve, the second time he made the All-Star team. He was brought into the middle of the game, threw out José Bautista from the outfield, and scored the National League's 5th run of the game. At the All-Star break, Pence was batting .321 with 10 home runs and 59 RBIs. On July 31, 2012, the Phillies sent Pence in a deadline deal to the San Francisco Giants. In return, the Phillies received Nate Schierholtz, Tommy Joseph, and Seth Rosin. On August 12, Pence hit his first home run as a Giant off Rockies' relief pitcher Rafael Betancourt. On August 21, despite Pence no longer being on the team, the Phillies went ahead with a previously-planned Hunter Pence bobblehead promotion. Before Game 3 of the 2012 NLDS, with the Giants down 2–0 and facing elimination against the Cincinnati Reds, Pence gave his teammates a passionate pregame speech in the dugout shortly before the first pitch. The Giants ended up beating the Reds in 3 straight games to advance to the NLCS. His inspirational speeches have been credited by his teammates as helping them rally together during the Giants' postseason and to eventually win the 2012 World Series. His speeches have also become the source of good-natured ribbing between Giants teammates. On July 13, 2013, Pence had a five-RBI game in a 9–0 Giants win over the San Diego Padres at Petco Park. With two outs in the bottom of the 8th inning, Pence robbed Jedd Gyorko of a hit by making a diving catch to preserve Tim Lincecum's no-hitter. On August 27, 2013, Hunter Pence hit what at the time was the longest home run of the season to date. The ball hit a wall above the left field bleacher seats at Coors Field. According to ESPN Tracking, the ball traveled an estimated 476 feet. Pence was named NL Player of the Month for September, hitting .293 with a .393 on-base percentage and 11 home runs and 32 RBIs. On September 10, Pence hit his 20th home run in the 1st inning and became the 7th San Francisco Giants player to hit 20 home runs and steal 20 bases in the same season and the first since Barry Bonds in 1998. (Bobby Bonds, Willie Mays, Jeffrey Leonard, Orlando Cepeda and Glenallen Hill are the others.) On September 14, Pence lifted his first career Giants grand slam over the center-field wall at Dodgers Stadium in Los Angeles off of Los Angeles Dodgers relief pitcher Stephen Fife and drove in a career-high 7 RBIs, helping propel the Giants to a historic 19–3 rout of their longtime rival the Dodgers. With the help of Brandon Belt's first career five-hit game, they scored the most runs in the history of Dodger Stadium. On September 16, Pence was named National League Player of the Week for the third time in his career, after hitting .448 with 6 home runs and 19 RBI. On October 7, in Game 4 of the 2014 NLDS against the favored Washington Nationals, Pence made a leaping catch against the right field wall in the 6th inning to deny Jayson Werth an extra-base hit. This dramatic play held the Giants' 2–1 lead, helping the Giants to secure an eventual 3–2 victory. His performance helped lead the Giants to their third World Series title in five years, as San Francisco went on to beat the Royals 3–2 in Game 7. Pence finished the series batting .444 with 5 RBIs and 7 runs scored. He had 12 hits in the series and, along with teammate Brandon Belt, had at least one hit in every game of the 7 game series. Pence's performance drew some media comparisons to Barry Bonds, in terms of unusual statistical production. On March 5, 2015, Pence suffered a fractured left forearm after being hit by a pitch during a spring training game against the Chicago Cubs. He started the regular season on the disabled list, ending his league-leading iron man streak of consecutive games played at 383. Pence started a rehab assignment with the Triple-A Sacramento River Cats on May 8 and was activated from the disabled list on May 16. Pence batted .282 with two home runs and 13 RBIs in 18 games before returning to the disabled list on June 11 with left wrist tendinitis. Pence was named National League Player of the Week for the fourth time in his career after batting .421 (8-for-19) with 2 home runs and 10 RBIs during April 25 – May 1, 2016. On May 14, Pence hit his 200th career home run in a game against the Arizona Diamondbacks. On June 1, 2016, Pence suffered a torn hamstring tendon of the right leg while running to first base and was expected to miss at least eight weeks. On May 15, 2017, Pence was placed on the 10-day disabled list due to a troubling left hamstring. For the season, he had the lowest line drive percentage of all major league hitters (13.4%). On April 3, 2018, Pence sprained his thumb while diving to make a play. Pence was placed on the 10-day disabled list due to this injury. On February 7, 2019, Pence signed a minor league contract with an invitation to spring training with the Texas Rangers. On March 21, 2019, the Rangers announced that Pence made the Opening Day roster. During the 2013 season, Pence kept to a strict Paleolithic diet. There have been conflicting reports since about his retention of this diet. Also in 2013 he was diagnosed with Scheuermann's disease, a spinal disorder that usually develops in adolescence. It was not discovered in Pence until his physical before signing a five-year $90 million contract with the San Francisco Giants in September. Pence appeared as himself in an episode of the television sitcom Fuller House in 2016. Pence appeared as a guest on an episode of Bill Nye Saves the World in 2017. Pence is the San Francisco host for Big League Impact, an eight-city fantasy football network created and led by longtime St. Louis Cardinals pitcher Adam Wainwright. In 2015, the organization raised more than $1 million for various charitable organizations. 2007 – National League Rookie of the Month- for the month of May. ^ a b c d e f g Fitzpatrick, Frank (August 21, 2011). "Hunter Pence's road to the majors". The Philadelphia Inquirer. Retrieved August 21, 2011. ^ "Hunter Pence is Philly style." The Philadelphia Inquirer: August 11, 2011. ^ "Hunter Pence Stats, Statistics, and Fantasy News". Rotowire.com. June 2007. Retrieved June 20, 2007. ^ Minor League All-Star Team. September 25, 2006. Baseball America. Retrieved 2011-09-30. ^ Richard Justice (March 21, 2007). "SportsJustice: Hunter Pence sent to Minors. For Now". Houston Chronicle. Retrieved June 20, 2007. ^ "MLB = Milwaukee Brewers/Houston Astros Recap Saturday April 28, 2007 – Yahoo! Sports". Associated Press. April 28, 2007. Retrieved April 29, 2007. ^ "Astros vs. Phillies July 3, 2007". baseball-reference.com. July 3, 2007. Retrieved August 4, 2014. ^ a b "Arizona's Valverde, Houston's Pence named co-winners of Bank of America Presents the National League Player of the Week". MLB.com. May 21, 2007. Retrieved May 22, 2007. ^ "Topps announces the 49th annual Topps Major League Rookie All-Star Team". Kansascity.royals.mlb.com. November 26, 2007. Retrieved October 5, 2011. ^ "SN awards: A-Rod is player of the year". Sporting News. October 15, 2007. Archived from the original on October 16, 2007. Retrieved January 5, 2008. ^ "Sporting News honors A-Rod – Third baseman earns magazine's Player of the Year award". MLB.com. October 15, 2007. Retrieved January 5, 2008. ^ Haudricourt, Tom (October 17, 2007). "Record-Setting Bat Propels Braun". Baseballamerica.com. Retrieved October 5, 2011. ^ "Major League Baseball Players Recognize Top Rookie in Each League". October 26, 2007. Archived from the original on May 17, 2011. Retrieved January 5, 2008. ^ "The 2007 Internet Baseball Awards; Results and Wrap-Up". Baseballprospectus.com. November 1, 2007. Retrieved October 5, 2011. ^ Justice, Richard (July 6, 2009). "Astros Pence, Tejada voted to NL All-Star team". Houston Chronicle. ^ a b "Houston Astros Outfielder Hunter Pence Named Bank of America Presents the National League Player of the Week" (Press release). MLB.com. September 7, 2010. ^ "Former 'Cat, Pence named to 2011 All-Star Game team". MiLB.com. July 3, 2011. ^ "Phillies land Houston's Hunter Pence in trade". San Francisco Chronicle. August 1, 2011. ^ Kepner, Tyler (August 16, 2011). "Phillies' Latest Ex-Astro Adds Big Bat to Winning Lineup". The New York Times. ^ "Phillies acquire Hunter Pence from Astros". Philadelphia.phillies.mlb.com. July 29, 2011. Retrieved October 5, 2011. ^ "Hunter Pence Statistics and History". Baseball-Reference.com. Retrieved October 5, 2011. ^ "San Francisco Giants Acquire Hunter Pence". ^ Dierkes, Tim. Giants Acquire Hunter Pence MLBTradeRumors.com. Retrieved July 31, 2012. ^ "Phils go ahead with Pence bobblehead giveaway". MLB.com. August 20, 2012. Retrieved March 7, 2015. ^ Jenkins, Bruce (October 10, 2012). "Pence puts a charge into his team". San Francisco Chronicle. ^ Smith, Brian. "Ex-Astro Hunter Pence wins World Series ring with Giants". UltimateAstros.com. Houston Chronicle. Retrieved November 1, 2012. ^ Brown, Daniel. "San Francisco Giants take page from football playbook". mercurynews.com. San Jose Mercury News. Retrieved November 1, 2012. ^ "Hunter Pence impressions". mlb.com. Major League Baseball Productions. Retrieved November 22, 2012. ^ "MLB.com video – Pence's stellar catch". ^ "ESPN Home Run Tracker". ^ a b c Simon, Andrew (September 30, 2013). "Pence's monster month earns NL honors". MLB.com. Retrieved July 14, 2014. ^ "Extra Baggs: Pence brings more than speed and power, etc". ^ "Giants pound LA behind 13 RBIs from Pence, Belt". ^ a b "Hunter Pence of the San Francisco Giants named National League Player of the Week". MLB.com (Press release). September 16, 2013. ^ Baggarly, Andrew. "Humble, humorous Hunter Pence accepts Willie Mac award". Retrieved March 23, 2014. ^ "Giants, Pence agree to five-year extension". ^ Haft, Chris (September 27, 2014). "Pence sits, ends consecutive starts streak". MLB.com. ^ Witz, Billy (October 8, 2014). "The Ball May Not Travel Far, but the Giants Earn a Trip to the N.L.C.S." The New York Times Company. Retrieved October 8, 2014. ^ Kroichick, Ron (October 25, 2014). "Pence leaves his fingerprints all over Giants' win in Game 4". San Francisco Chronicle. ^ MLB Advanced Media (October 29, 2014). Pence, Belt tie WS hit mark. ^ Schulman, Henry (March 6, 2015). "Hunter Pence upbeat despite broken arm". San Francisco Chronicle. Retrieved March 7, 2015. ^ Baggarly, Andrew (April 6, 2015). "Giants hang on, beat Diamondbacks 5–4". San Jose Mercury News. ^ "Hunter Pence to begin rehab assignment Friday at Triple-A Sacramento". The Associated Press. ESPN.com. May 7, 2015. ^ Baggarly, Andrew (May 15, 2015). "Hunter Pence joining Giants in Cincinnati, will be activated Saturday". San Jose Mercury News. ^ Haft, Chris; Macklin, Oliver (June 11, 2015). "Giants place Pence on disabled list". MLB.com. ^ DiComo, Anthony; Haft, Chris (July 7, 2015). "Cain's solid start buoyed by Pence's big night". MLB.com. ^ Haft, Chris; Macklin, Oliver (July 10, 2015). "Pence's slam leads Giants' rout of Phillies". MLB.com. ^ Haft, Chris (October 20, 2015). "Pence to miss time with oblique injury". MLB.com. 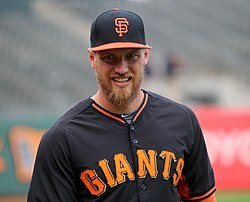 ^ a b "Giants' Hunter Pence named National League Player of the Week" (Press release). MLB.com. May 2, 2016. ^ Pavlovic, Alex (May 14, 2016). "Hunter Pence hits his 200th career home run". CSN Bay Area. Retrieved May 15, 2016. ^ Schulman, Henry (June 3, 2016). "Pence expected to have leg surgery, miss 8 weeks". San Francisco Chronicle. ^ Wagaman, Michael. "Hamstring sends Hunter Pence to DL". MLB. Retrieved May 15, 2017. ^ Padilla, Doug. "Giants place Pence on DL with sprained thumb". MLB. Retrieved April 20, 2018. ^ "Rangers sign outfielder Hunter Pence to minor league deal". ESPN. Associated Press. February 7, 2019. Retrieved February 22, 2019. ^ Sullivan, T.R. (March 21, 2019). "Pence makes Rangers; Calhoun to be optioned". MLB.com. MLB. Retrieved March 21, 2019. ^ Ostler, Scott (February 22, 2014). "Hunter Pence's smart diet is food for thought". SFGate. Retrieved March 22, 2014. ^ Keeling, Brock (March 31, 2014). "He Might Be Giant: A Day in the Life of Hunter Pence". 7x7. Retrieved April 1, 2015. ^ Rosenthal, Ken (October 12, 2014). "THERE'S A GOOD REASON WHY HUNTER PENCE THROWS LIKE THAT". Fox Sports. Retrieved October 12, 2014. ^ "Hunter Pence gets engaged, releases video of proposal". CSNbayArea.com. December 3, 2015. Retrieved December 3, 2015. ^ "Giants star Hunter Pence appears on 'Fuller House'". KTVU. February 26, 2016. Retrieved May 23, 2016. ^ "Hunter Pence appeared on Bill Nye's new show because of course he did". MLB.com. April 23, 2017. ^ Iyer, Vinnie (August 5, 2016). "Adam Wainwright is a true ace — when it comes to fantasy football". The Sporting News. Retrieved August 6, 2016. ^ Minor League All-Star Team. September 25, 2006. Baseball America. Retrieved 2011-08-21. ^ "Pedroia, Pence selected as Rookies of the Month". MLB.com. June 4, 2007. Retrieved June 4, 2007. Vitez, Michael (August 29, 2011). "Baseball and socks appeal". The Philadelphia Inquirer. Retrieved September 2, 2011. He cuffs his pants higher than almost any player, at the knee, the way it was done a century ago. Wikimedia Commons has media related to Hunter Pence. This page was last edited on 24 April 2019, at 05:55 (UTC).